We wake up in the morning and are excited to start our day. In the morning we head down and check out of our hostel and decide to take a load off and surf the internet and catch up on what we’ve been missing. The Pfefferbett hostel also offers an all-you-can-eat breakfast for about 5 euro. The breakfast consisted of coffee, bread, cheeses, spreads, cold-cuts and cereal. Since we haven’t really eaten too much this whole trip, it was nice to eat as much as you want and what you want (Truly an American thing, huh?). 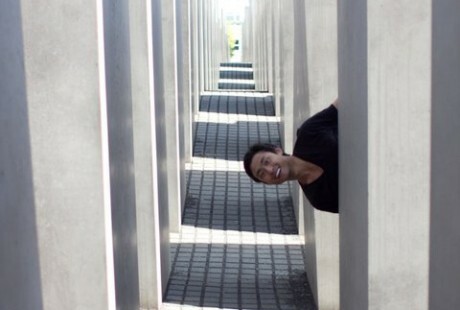 Afterwards we decide to visit the Memorial for the murdered Jews of Europe off Cora-Berliner-Strasse street. I was excited that the sun decided to come out and allowed us to get some cool photos. We play around and enjoy the memorial. We end up getting some really cool shots but are soon told by the security guard to get down. I guess you’re not supposed to jump on the blocks (although we saw multiple people doing the same thing). This would be an awesome place to play hide and seek. This would be a bad place for someone who gets scared easily. If you ever needed to lose someone who was chasing you, this is the perfect place. Speaking of #3, we ended up attracting the attention of the security guard another time as we wanted to get one last shot on one of the blocks. Of course we had to play with the idea of playing hide and seek with the guard. After playing hide and seek, it took about 10 minutes just to find each other again, we head back to the train station to return the camera. It is at this time we realize that our flight is coming up. We hurry back to the hostel to check out and head back to the metro station to catch our flight to Amsterdam. Little did we know, we’d be going back and forth with trains shutting down and going in reverse. We burn a lot of time trying to use the metro and finally decide we need to take a taxi in order to make our flight on time. It then takes us about 30 minutes to get a taxi to take us to the airport. The kicker? We find out it will take 45-50 minutes to drive to the airport and about 40 euro to get there. We are cutting it EXTREMELY close as we need to be at the gate in 50 minutes. Not good. Of course the taxi driver almost gets into an accident trying to get us to the airport quickly in which both of us realize we didn’t have our seat belts on. We didn’t need to be told twice and we quickly buckle up in fear of dying. Bitting our nails along the way, we finally make it to the airport with 5 minutes to ‘spare’. We hustle to the security checkpoint and OF COURSE, I get stopped for having liquids outside a bag. Just our luck. The person checking our tickets give us a ‘look’ that screamed “good luck buddy”. Tim rushes to the gate to try to tell the guard that I will be coming shortly. Now I find myself fast walking to the gate (which was like 10 minutes away). It didn’t help that this airport was build like a shopping center and I find myself walking straight through ‘Duty Free’ and all the people stopping to smell perfume. I arrive at the gate with no one to be found. Tim is in the distance giving me the signal that we are out of luck. We were 10 minutes late. What killed us was that only the gates closed 30 minutes prior and the passengers were just on the other side of the door waiting to board the plane. Bummer. We head back out into the lobby to try to find internet. We spot a lounge and head upstairs to find the premier flyers club. It was so packed you could hear a pin drop. Yea, pretty busy up in that premier club. We explain the situation and ask if we could quickly log in to find another flight our weigh our options. No dice. Well, at least we got Haribos. After waiting around and trying to figure things out, we find out we are out of luck. The next flight and train to Amsterdam is not until tomorrow afternoon at around 5pm. We quickly book another hostel in Berlin before Tim’s laptop battery dies. Well, it looks like another night in Berlin! I have no problem with that. 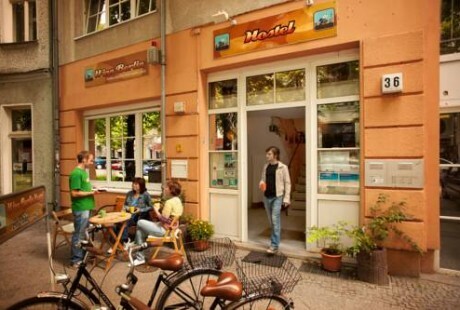 We head back out and take a metro to our next hostel, U Inn Berlin Hostel. After walking around for quite some time to try to find this hostel, we finally find it on a small street just off the main street. The staff was friendly although the hostel reminded me of our first hostel in Spain. It was smaller and seemed a little less secure. We head up to our room and greet the backpackers. Since it has been a long day, we decide to take a quick nap. What seemed like a nap quickly turned into about a 5 hour sleep. We must’ve been exhausted! We wake up and start some conversation with two girls from Amsterdam who thought we were practically dead. I mean we slept for quite some time in the middle of the day. We also chat it up with another backpacker from San Francisco. We decide to take it easy for the rest of the night and end up just chatting with some other travelers and discuss our adventure. We turn in early for the night as we have practically a whole day tomorrow to explore more of Berlin and head to Amsterdam.